Background and objectives: Since the first description of pathology of the kidney in Waldenström disease in 1970, there have been few reports on kidney complications of IgM-secreting monoclonal proliferations. Here, we aimed to revisit the spectrum of renal lesions occurring in patients with a serum monoclonal IgM. Design, setting, participants, & measurements: Fourteen patients with a circulating monoclonal IgM and a kidney disease related to B cell proliferation were identified retrospectively. Demographic, clinical, and laboratory data were assessed for each patient at the time of kidney biopsy. Results: Seven patients had a nephrotic syndrome. Patients without nephrotic syndrome all had impaired renal function. Mean serum creatinine was 238 μmol/L. For five patients, the diagnosis of monoclonal IgM preceded the kidney disease by 28.8 mo (range 12 to 60). Seven patients had Waldenström disease, two had a small B cell non-Hodgkin lymphoma, one had an IgM-excreting multiple myeloma, one had a marginal zone B cell lymphoma, and three had an IgM-related disorder. Renal lesions included (1) intracapillary monoclonal deposits disease with granular, electron-dense IgM thrombi occluding capillary lumens (5); (2) atypical membranoproliferative glomerulonephritis (3); (3) λ light chain amyloidosis (2) associated with μ deposits in one patient; (4) acute tubular necrosis (1); and (5) CD20+ lymphomatous infiltration (3). Remission of the nephrotic syndrome was attained in three of seven patients, and renal function improved after chemotherapy. Conclusions: Although renal complications of IgM proliferations are rare, a wide spectrum of kidney lesions is observed, without correlation with the type of hematologic disorder. The spectrum of renal diseases associated with proliferations of the B cell lineage is continuously expanding. Most of them are caused by deposition of a monoclonal Ig or a fragment thereof, whereas others include neoplastic cell infiltration, nephrocalcinosis, and infection-related complications. Solomon et al. (1) first demonstrated that human renal lesions associated with deposition of monoclonal lights chains (LC) could be reproduced in mice by intraperitoneal injection. Subsequent studies have shown that the pattern of renal lesions associated with the deposition of monoclonal Ig mostly depends on biochemical and structural abnormalities of Ig (2). Most renal complications occur in patients who produce free LC with or without complete IgG molecules. Renal complications of malignant IgM-secreting proliferations are rare. Their incidence seems to have decreased, mostly because of improved therapy of Waldenström macroglobulinemia (WM), the major cause of those nephropathies. First reviewed by Morel-Maroger et al. (3), WM-related nephropathies include characteristic intracapillary deposits of IgM with or without cryoglobulinemia, AL-amyloidosis, and infiltration of the interstitium by neoplastic lymphoplasmacytic cells. Subsequent case reports included immunotactoid and nonamyloid fibrillary glomerulopathy (4,5), cryoglobulinemia-related glomerulonephritis (6), and crescentic glomerulonephritis (7,8). Cases of cast nephropathy (9), Fanconi syndrome (10), and LC deposition disease (11) as a result of free LC toxicity have also been reported in patients who presented with a circulating monoclonal IgM. In this study, we retrospectively analyzed 14 patients with renal lesions associated with an IgM-secreting proliferation with the aims of reappraising the relative prevalence of the various renal lesions and underlying hematologic disorders, the characteristics of the nephropathies, and the patients’ outcome. We included both renal lesions that were caused by cell infiltration and those that were caused by the deposition of the monoclonal component (complete IgM and/or isolated LC) to cover the full disease spectrum. Fourteen adult patients with a circulating monoclonal IgM and a kidney disease apparently related to B cell proliferation were identified in seven departments of nephrology between 1989 and 2005. Patients with a hepatitis C–related or essential type 2 cryoglobulinemia were excluded from the study. Demographic, clinical, and laboratory data were assessed for each patient at the time of kidney biopsy. Follow-up data were obtained for all but one patient. Nephrotic syndrome was defined by urinary protein excretion >3 g/d and serum albumin <30 g/L. Impaired renal function was defined as a GFR <60 ml/min per 1.73 m2 according to the Modification of Diet in Renal Disease (MDRD) formula. Acute kidney injury was defined according to RIFLE (risk, injury, failure, loss, ESRD) criteria (12). Hypertension was defined as BP >140/90 mmHg (13). Diagnosis of IgM multiple myeloma was based on the finding of bone marrow infiltration by at least 10% dysmorphic plasma cells associated with a monoclonal IgM in the serum (14). A diagnosis of WM was established on the presence of a serum monoclonal IgM associated with intratrabecular polymorphic lymphoplasmacytic infiltrate on bone marrow examination (15). Diagnosis of other lymphoproliferative disorders was based on the World Health Organization classification (16). A diagnosis of IgM-related disorder was made for patients with Ig-related renal disease but without bone marrow infiltration, osteolytic lesions, or tumoral syndrome on clinical and morphologic examination by computed tomography scan (17). All patients underwent a kidney biopsy. All biopsies were processed by standard techniques and systematically stained with Congo red and examined under polarized light. The two biopsies (4 and 5) showing congophilic deposits were tested for amyloid A protein deposits by immunohistochemistry in paraffin-embedded sections (anti-amyloid A protein antibody; Dako, Trappes, France). For immunofluorescence (IF), 3-μm cryostat sections were incubated with polyclonal FITC-conjugated antibodies to human γ, α, and μ Ig heavy chains (HC); κ and λ LC; C1q; C3; fibrinogen; and albumin (Dako). Cellular infiltrate phenotype was studied with biotinylated anti-CD3, -CD20, and -CD68 antibodies (Dako) and revealed with peroxidase streptavidin conjugate. Ultrastructural analysis was performed in seven cases (2, 4, 5, 6, 8, 9, and 14) using a JEM 1010 electron microscope (JEOL, Tokyo, Japan). The diagnosis of renal disease related to monoclonal IgM was based on the presence of μ HC deposits, in the absence of α and γ chains, and /or on exclusive staining for either the κ or the λ LC. Cryoglobulinemia was detected by cold precipitation of serum samples from blood that was collected and processed at 37°C. Sera were stored at 4°C for up to 1 wk for detection of cryoprecipitation. Complement fractions C3 (normal range 0.85 to 1.6 g/L), C4 (normal range 0.15 to 0.45 g/L), and total hemolytic activity (CH50) were determined for each patient. IgM-enriched preparations were obtained by euglobulinic precipitation (120 μl serum/5 ml distillated water) of sera from a patient with amyloidosis staining for μ and λ chains and from two control patients with a serum monoclonal IgM without renal involvement. For N-deglycosylation, 20 μg of enriched IgM preparations was denatured by heating for 10 min at 100°C. After addition of 0.5% NP40, G7, and glycoprotein denaturing buffers, preparations were incubated 1h at 37°C with PNGase F (N glycosidase F from Flavobacterium meningosepticum; New England Biolabs, Ipswich, MA) at a concentration of 50 U/μg protein. One microgram of deglycosylated and nondeglycosylated proteins was fractionated by 8% SDS-PAGE and electrotransferred onto a nitrocellulose membrane. After overnight saturation at 4°C in PBS 0.05% Tween 20, and 5% skim milk, the membrane was incubated for 1 h at 25°C with alkaline phosphatase–conjugated goat anti-human μ Ig chains (1:2000; Jackson Immunochem Labs, West Grove, PA) and revealed with tetrazolium nitroblue/bromo-chloro-indolyl-phosphate substrate. The study included 14 patients. There were 11 men and three women aged 55 to 75 yr at the time of diagnosis of kidney disease (mean age 67.6 yr). Renal symptoms included a nephrotic syndrome in seven patients (4, 5, 6, 7, 8, 12, and 13) associated with acute kidney injury in four cases (6, 7, 8, and 12). The average daily proteinuria in patients with the nephrotic syndrome was 7.2 g (4.5 to 16.0 g). The seven patients without nephrotic syndrome (1, 2, 3, 9, 10, 11, and 14) had impaired renal function in all cases, with acute kidney injury in four cases (3, 9, 10, and 14). In the patients without nephrotic syndrome, the mean daily proteinuria was 0.93 g (0.35 to 2.00 g). Mean serum creatinine level at first renal evaluation was 238.5 μmol/L (range 77.0 to 557.0 μmol/L), and the mean value of GFR was 35.2 ml/min per 1.73 m2. Two patients (9 and 11) with WM but none of those with renal lymphomatous infiltration had hepatosplenomegaly or lymphadenopathy on clinical and morphologic examination (Table 1). All three patients (1, 2, and 3) with lymphomatous infiltration had impaired renal function with acute kidney injury in one case (patient 3) without nephrotic syndrome (mean daily proteinuria was 0.48 g) and kidney enlargement. Clinical presentation in the two patients (4 and 5) with AL-amyloidosis included nephrotic syndrome (average proteinuria 11 g/d) with impaired renal function in one case. Among the five patients with a typical intracapillary monoclonal deposits disease (ICMDD; 6 through 10), three (6, 7, and 8) displayed a nephrotic syndrome (mean daily proteinuria 5.7 g/d). Microscopic hematuria was present in three patients (7, 8, and 9). Acute kidney injury occurred in all cases of ICMDD irrespective of the degree of proteinuria. Renal symptoms in the three patients (11, 12, and 13) with membranoproliferative glomerulonephritis (MPGN) consisted of impaired renal function in all patients associated with nephrotic syndrome in two cases (12 and 13). Urinalysis showed microscopic hematuria in all three patients. The last patient (patient 14) exhibited a typical acute tubular necrosis with acute kidney injury. For five patients (3, 4, 7, 8, and 11), the diagnosis of a monoclonal IgM was made before renal disease onset with a median interval of 28.8 mo (12 to 60 mo). The hematologic disorder consisted of monoclonal gammopathy of undetermined significance in one patient (patient 4), splenic marginal B cell lymphoma in one patient (patient 8), and WM in three patients (3, 7, and 11). In three patients (7, 8, and 11), the renal disease occurred during a relapse. In two patients, the occurrence of kidney disease revealed a transformation of lymphoproliferative disorder (monoclonal gammopathy of undetermined significance into small B cell non-Hodgkin lymphoma in patient 4 and splenic marginal zone B cell lymphoma into WM in patient 8). In the nine remaining patients, the diagnosis of hemopathy and kidney disease was made simultaneously (Table 1). All patients included in this study had a monoclonal IgM with a mean concentration of 11.65 g/L (4 to 28.4 g/L) without hyperviscosity syndrome. Free LC (seven λ and seven κ) were detected in the urine of all patients. Both patients with AL-amyloidosis had increased serum levels of free λ LC, and the three patients with MPGN had increased serum levels of free κ LC. Three patients with ICMDD and WM (7, 8, and 9) had low blood complement C3, C4, and CH50 levels without detectable cryoglobulinemia in two of them, whereas type 1 cryoglobulinemia was detected in patient 9. In the patients with ICMDD associated with splenic marginal zone B cell lymphoma or an IgM-related disorder, complement levels were in the normal range. CH50 and levels of C3 and C4 components did not suggest complement activation in patients with type 1 MPGN. Repeated search for cryoglobulins was negative for all except one patient (patient 9). Five patterns of renal lesions could be described (Table 2). Three patients (1, 2, and 3) had a neoplastic lymphoplasmacytic infiltration of the interstitium (Figure 1, A and B). Immunostaining demonstrated the large predominance of CD20+ lymphocytes within the infiltrates (Figure 1C). Cellular infiltration was patchy and prominent in the superficial cortex overlapping the renal capsule. Renal tubules were separated and atrophic or destroyed as a result of interstitial fibrosis. Focal nonspecific thickening of tubular basement membranes and degenerative tubular epithelial lesions were seen. There were no myeloma-type casts by light microscopy, but some casts were positive for μ and λ chain in patients 1 and 2. Global sclerosis and periglomerular sclerosis affected 30 to 60% of the glomeruli. 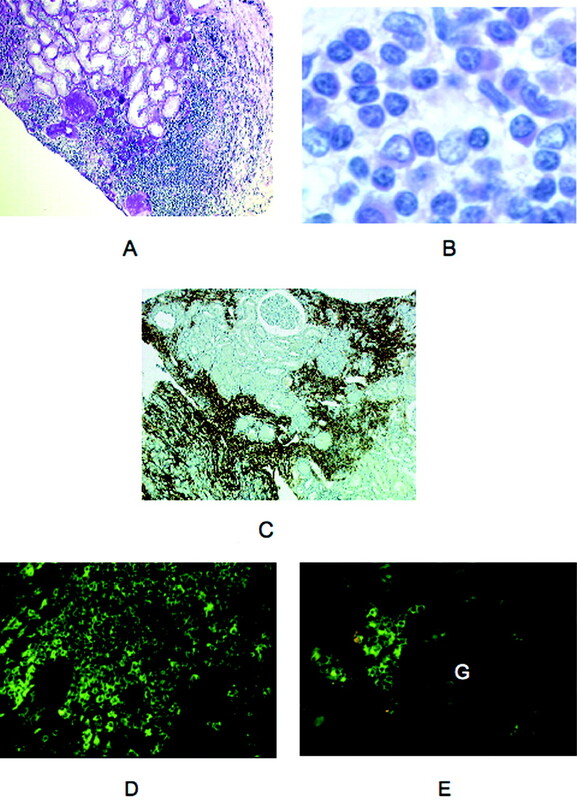 By IF, lymphoplasmacytic cells stained positive for μ and λ chains in patients 1 and 2 and exclusively for κ chain in patient 3 (Figure 1, D and E). Representative cases of lymphomatous infiltrate in the context of Waldenström macroglobulinemia (WM; light microscopy, immunofluorescence). (A) patient 3. Lymphoplasmacytic infiltrate of the interstitium in the external cortex close to an area of interstitial fibrosis with global glomerulosclerosis and tubular atrophy. Note cellular infiltration of the renal capsule (light microscopy, periodic acid-Schiff [PAS] stain). (B) Patient 1. Interstitial expansion secondary to lymphoplasmacytic infiltration (light microscopy, hematoxylin and eosin stain). (C) Patient 1. Immunocytochemical staining of patchy cortical cellular infiltrates showing numerous CD20+ cells. (D) Patient 2. By immunofluorescence (IF), cellular infiltrate stained brightly for μ chain. Some cells showed a cytoplasmic staining (FITC-conjugated anti-μ antibody). (E) Patient 2. Interstitial neoplastic cells were also stained for λ chain. Note the pericellular or cytoplasmic pattern of fluorescence. No deposits were seen in the glomerulus (G; FITC-conjugated anti-λ antibody). Magnifications: ×100 in A and C; ×1000 in B; ×400 in D and E.
Two patients (4 and 5) had congophilic deposits. These deposits were small and restricted to the mesangium in patient 4; they were more abundant in the glomeruli and also visible in some arteriolar and capillary walls in patient 5 (Figure 2A). Electron microscopy (EM) showed mesangial and focal transmembranous accumulation of 10-nM fibrils typical of amyloid (Figure 2B). In patient 4, the amyloid glomerular deposits were revealed by anti-λ antibody, whereas some casts and proximal tubule epithelia were brightly stained with both the anti-μ and anti-λ. All of the amyloid deposits of patient 5 stained brightly for both μ and λ and were not revealed by anti-γ, anti-α, and anti-κ and anti-albumin antibodies (Figure 2, C and D). AHL amyloidosis in patient 5 (light microscopy, electron microscopy [EM], IF). (A). Amyloid deposits were seen in the hilum, in mesangial areas, and segmentally along glomerular capillary walls (light microscopy, Masson trichrome stain). (B) Ultrastructural analysis showed focal transmembranous and subepithelial accumulation of amyloid fibrils with effacement of podocyte foot processes (EM). 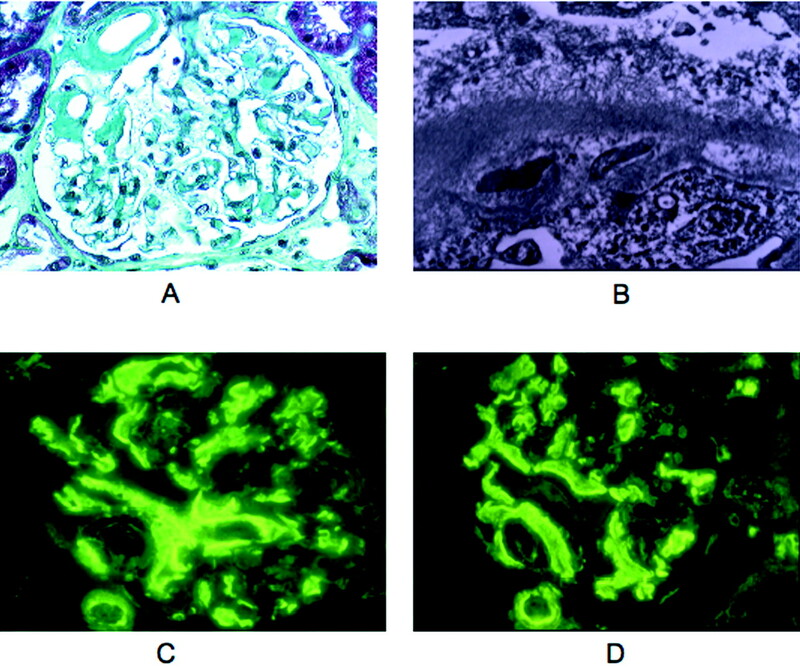 (C and D) Glomerular and arteriolar amyloid deposits were equally stained for μ and λ chains and were negative for γ, α, and κ chains as well as for C3, C1q, and albumin (data not shown; FITC-conjugated anti μ [C] and anti-λ antibodies [D]). Magnifications: ×400 in A, C, and D; ×20,000 in B. On Western blot after SDS-PAGE, a predominant subunit revealed by anti-μ antibody had a normal size (approximately 60 kD after deglycosylation). Another μ-reactive band of lower size (approximately 45 kD) was also demonstrated in the patient's sample and not in control samples (Figure 3). In the absence of molecular analyses of the amyloid material itself, the significance and nature of this serum fraction remains uncertain. 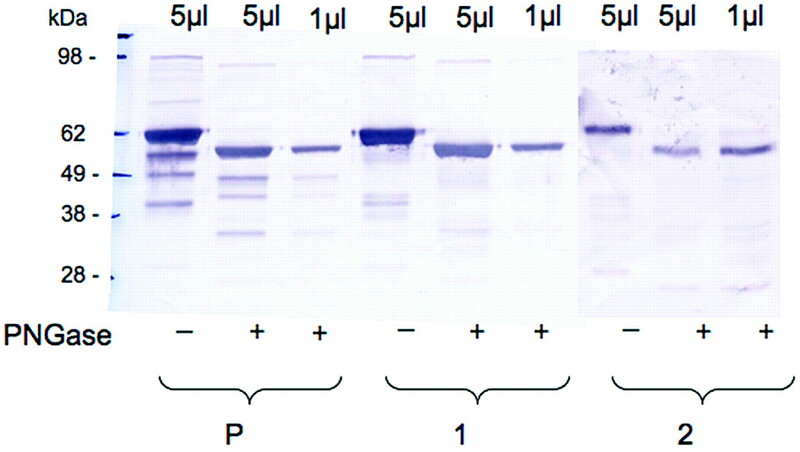 Western blot analysis of IgM-enriched fractions from patient 5 (P) and from two control subjects (1 and 2) with (+) or without (−) PNGase treatment. A predominant μ chain subunit with normal apparent molecular weight (approximately 60 kD) and a less abundant lower sized (approximately 45 kD) component are detected in the patient 5 sample. In five patients (6 through 10), the pattern of renal disease was ICMDD. The most striking glomerular lesions consisted in noncongophilic polychromatophilic, periodic acid-Schiff–positive intracapillary deposits variable in size and distribution. In patient 7, the deposits were regular in size, global, and diffuse (Figure 4A). In patients 6 and 8, they looked like huge occluding capillary plugs leading to segmental glomerular invasion (Figure 4B). Subendothelial and intramesangial deposits could also be observed, together with aspects mimicking capsular drops in the Bowman's capsule. Deposits resembling glomerular thrombi were seen in the intima or the lumen of arterioles in three cases (Figure 4B). Mesangial matrix increase and hypercellularity as a result of the presence of CD68+ cells were absent or mild and focal, except in patient 10, who had an accentuation of the lobular pattern of the glomeruli admixed with segmental mesangiolysis. Capillary tufts devoid of deposits had a wrinkled appearance. By IF, all of the deposits strongly stained for the μ chain and for either κ or λ LC (three κ and two λ; Figure 4C). C3 deposits were associated in two cases (7 and 9). 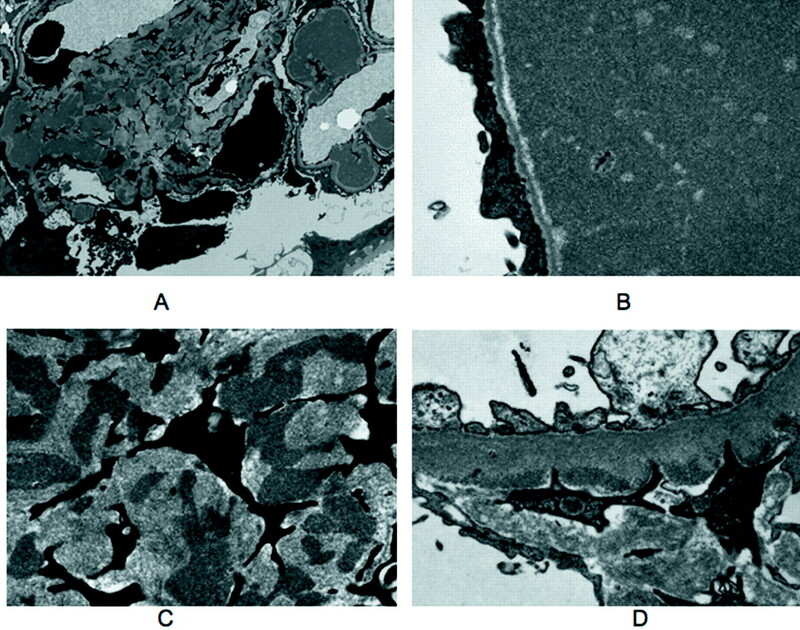 By EM, the large intracapillary deposits dilating the capillary lumen and elongating the basement membrane were electron dense and granular (Figure 5, A and B). Some focal subendothelial and mesangial deposits had the same appearance (Figure 5, C and D). In patient 9, EM showed disorganized Ig deposits as observed in other ICMDD cases. No organized microtubular monoclonal Ig deposits were visualized, suggesting ICMDD diagnosis rather than cryoglobulinemic glomerulonephritis. Representative cases of intracapillary monoclonal deposits disease (ICMDD; light microscopy, IF). (A) Patient 7. PAS positive intracapillary thrombi in a glomerulus. Note the absence of cellular proliferation (light microscopy, PAS stain). (B) Patient 8. Huge polychromatic capillary plugs responsible for massive occlusion of glomerular capillary lumens. A large deposit also occluded some arteriolar lumens (light microscopy, Masson trichrome stain). (C) Patient 7. Bright staining of intraglomerular thrombi for μ chain. The same fluorescence pattern was obtained with an anti-λ antibody but not with anti-κ, anti-C3, and anti-C1q antibodies (data not shown; IF, FITC-conjugated anti-μ antibody). Magnification, ×400. Ultrastructural analysis of representative cases of ICMDD. (A) Patient 8. Low-power magnification electron micrograph of a glomerulus showing intracapillary deposits and irregular deposits in increased mesangial matrix. (B) Patient 8. Electron micrograph of a glomerular capillary lumen filled by electron-dense material. No organized structure was seen. Note capillary wall basement membrane stretching with sparing of the lamina densa and effacement of podocyte foot processes. (C) Patient 8. High-power magnification revealed the same granular aspect of mesangial deposits. (D) Patient 6. Electron micrograph showing scarce granular subendothelial deposits. Magnifications: ×6000 in A; ×25,000 in B and C; 20,000 in D.
Three patients (11, 12, and 13) had MPGN, although cellular proliferation and mesangial matrix increase were heterogeneous from one glomerulus to another (Figure 6, A and B). Endocapillary hypercellularity and macrophage infiltration were usually more prominent than duplication of glomerular basement membranes, which appeared segmental. In patient 12, glomerular infiltration by polymorphonuclear cells was remarkable (Figure 6C). Segmental fibrocellular crescents affecting a small number of glomeruli were observed in two cases. IF showed a bright μ and κ staining along the glomerular peripheral capillaries in a granular pattern with scarce small intracapillary thrombi (Figure 6D). In two cases (12 and 13), the μκ deposits were associated with C3 staining. In addition to the glomerular lesions, patient 13 displayed a CD20+ cellular infiltrate in the interstitium. 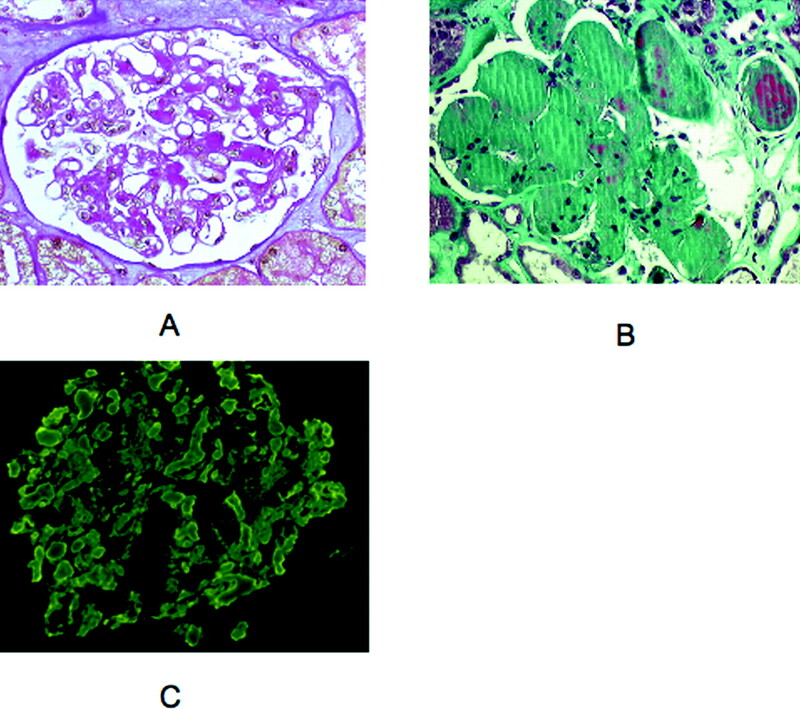 Representative cases of membranoproliferative glomerulonephritis (MPGN) with atypical features (light microscopy, IF). (A) Patient 13. Membranoproliferative pattern was shown with accentuation of glomerular lobules and segmentally thickened capillary walls (light microscopy, Masson trichrome stain). (B) Patient 13. Some small subendothelial and intraluminal deposits stained red with the trichrome stain. Proliferation of mesangial and endothelial cells was moderate. Note segmental mesangiolysis (light microscopy, Masson trichrome stain). (C) Patient 12. Numerous infiltrating neutrophils were observed in some glomeruli (light microscopy, Silver stain). (D) Patient 13. Peripheral capillary wall deposits with granular texture were predominant in segmental areas outlining the double contours. This deposits stain for μ chain and κ chain (data not shown; IF, FITC-conjugated anti-μ antibody). Magnification, ×400. One patient (patient 14) had prominent proximal tubular lesions characterized by marked cytoplasmic vacuolization and epithelial flattening in the absence of typical cast nephropathy. A mild T lymphocyte infiltrate with moderate interstitial fibrosis was seen. IF examination showed bright tubular droplets staining for μ and λ chains. No deposits were seen in glomeruli or along tubular basement membranes by EM. Twelve of 14 patients received specific chemotherapy. Chemotherapy regimen was declined by the last two patients (13 and 14). After chemotherapy, mean serum creatinine level decreased from 222 (77 to 466 μmol/L) to 165 μmol/L (100 to 274 μmol/L). Renal function dramatically improved after chemotherapy in two patients (7 and 9). Among the seven patients with nephrotic syndrome, the mean proteinuria decreased from 7.5 to 2.8 g/d after exclusion of patient 13, who was lost for follow-up. Remission of nephrotic syndrome was attained in three patients (6, 7, and 12). Two patients (1 and 12) presented with a lymphoma relapse 3 and 4 yr, respectively, after initial diagnosis. At the end of follow-up (average follow up 35 mo), four patients were dead (1, 5, 6, and 11) and four patients (9, 11, 12, and 14) required permanent hemodialysis during the follow-up (Table 3). We aimed to revisit the spectrum of kidney diseases found in patients with a serum monoclonal IgM. Two significant findings are the first description of a case of immunoglobulinic amyloidosis with both λ and μ deposits and the observation that severe renal disease comparable to that observed in WM could occur in the context of IgM-related disorder, a term that was proposed for patients without bone marrow infiltration but who present symptoms that are attributable to a monoclonal IgM (17). Renal lesions were related either to lymphoplasmacytic infiltration or to deposition of either the monoclonal IgM (ICMDD, MPGN) or a free monoclonal LC (amyloidosis). In addition, one patient who presented acute tubular necrosis was included in the study because tubular droplets stained for μ and λ chains exclusively. The most characteristic renal complication of IgM-secreting B cell proliferations is ICMDD. In the first series of 16 patients with WM-associated kidney disease, ICMDD was found in six patients and defined as nonamyloid deposits on the endothelial aspect of the basement membrane so voluminous as to occlude the capillary lumens (3). These thrombi were strongly periodic acid-Schiff positive, and cellular proliferation in glomeruli was absent or mild. By IF, the thrombi stained for IgM in the three studied patients and for κ chain in the only biopsy analyzed with anti-LC isotype antibody. No EM was performed. All patients with intraglomerular thrombi or deposits were found to have either a cryoglobulin or a high level of circulating IgM, which led Morel-Maroger et al. (3) to suggest that the circulating monoclonal IgM might precipitate in the capillary lumens because of increased blood viscosity. Several isolated cases of ICMDD have been reported since (18–20). Our findings provide new insights into the etiology, pathology, and pathophysiology of ICMDD. (1) Of the five patients with ICMDD, only three had WM, whereas the two others had an IgM-related disorder and a B cell lymphoma of the splenic marginal zone, respectively. Our study showed that glomerulonephritis with intracapillary thrombi of IgM originally described by Morel-Maroger as follows: “Waldenstrom macroglobulinemic glomerulonephritis” is not specific of WM and we suggest that the term of ICMDD may be more appropriate in this context. (2) By IF, thrombi (intracapillary deposits) stained for μ and either κ or λ LC, in all cases, and by EM they showed an electron-dense, granular appearance. (3) Strong activation of the classical complement pathway, with a very low level of C4, was suspected in three patients. Complement consumption was associated with C3 deposits in thrombi in two of these patients and with a cryoglobulinemia in one (type 1 cryoglobulinemia). (4) All patients had a moderate level of circulating monoclonal IgM (4 to 15 g/L) and did not show clinical manifestations of hyperviscosity, which could be ruled out as a pathogenic factor. These data rather suggest abnormal physicochemical properties of the IgM. Glomerular capillaries seem to be a particularly vulnerable site for deposition of nephritogenic IgM because ultrafiltration further increases the protein concentration; however, intravascular deposition is not limited to glomerular capillaries because thrombi were also found in the kidney arterioles in three of our patients (6, 8, and 9), and in the skin (20). The propensity of complexed or deposited IgM to activate strongly the classical complement pathway might aggravate renal lesions (21). AL-amyloidosis is now a widely recognized complication of WM. A series of 50 patients with a serum monoclonal IgM and biopsy-proven amyloidosis were evaluated at the Mayo Clinic (25). All eight amyloid deposits studied stained for an Ig LC, indicating that amyloidosis was of the AL type. The clinical spectrum of IgM-related amyloidosis was recently reviewed (26). We report two patients with λ LC in amyloid deposits. In one of the two patients, μ HC deposits were detectable with the same pattern as the λ deposits. The implication of an Ig HC in amyloidosis is a very rare finding with only a few reported cases in the literature. AH-amyloidosis involved isolated gamma chains in most cases (27–31). Eulitz et al. (27) demonstrated that the pathogenic IgG1 HC had an internal deletion of the CH1, hinge, and CH2 domains, with the variable domain being directly joined to CH3 domain, thus strikingly resembling an Ig LC. In our case, the patient's serum IgM was essentially made up of a normal-sized μ chain, although another, less abundant subunit of approximately 45 kD was also evidenced by anti-μ antibody on Western blot. Whether the latter might correspond to a μ chain with an internal domain deletion or a degradation product remains uncertain. Of note, in the first described case of AH-amyloidosis reported by Eulitz et al. (27), the serum contained a predominant entire IgG, including a nondeleted γ chain, whereas a minor deleted γ chain subunit was found in tissue deposit. The renal toxicity of μ HC has previously been described mainly during HC deposition disease, although this entity remains extremely rare (32,33). Only one case report demonstrated μ HC amyloidosis, but the molecular basis of such exceptional finding remains to be determined (34). Alternatively, the detection of μ chain on deposits might relate to binding of a “multireactive” monoclonal IgM to already formed AL-type amyloid fibrils. Our study establishes that the spectrum of IgM-secreting B cell proliferations associated with kidney disorder is much broader than WM. Except for lymphomatous infiltration that was associated to WM only, the other kidney diseases occurred in a variety of hematologic settings. This observation indicates that the pathogenesis of the renal disease involves unusual properties of the monoclonal component irrespective of the underlying hematologic disease. In the cases classified as IgM-related disorder, we cannot exclude further development of an active lymphoid malignancy; therefore, careful follow-up is required for these patients. The aim of this retrospective study was not to establish prognostic factors or therapeutic recommendations; however, chemotherapy induced a significant decrease of proteinuria in four of six patients with the nephrotic syndrome (one was lost for follow-up) and a complete remission in three of them. This was associated with complete or partial remission of the hemopathy in five of the six patients. Glomerular diseases related to monoclonal IgM deposition should be considered as paraneoplastic glomerulopathies (35), with the monoclonal IgM or related free LC being the link between the hemopathy and the kidney disease; therefore, treatment should target the IgM-secreting malignant clone. The same objective should be achieved when the clone is benign. Although renal complications of IgM-secreting monoclonal proliferations are rare, they show a wide spectrum of underlying hematologic disorders and kidney lesions, thus underscoring the value of kidney biopsy. Glomerulopathies that occur in this setting should be treated with the aim of eradicating the IgM-secreting clone. This work was supported by grants from AURA (Association pour l'Utilisation du Rein Artificiel), INSERM, University of Paris 6. We thank Dr. D. Desvaux (Department of Pathology, Henri Mondor Hospital), Dr. S. Ferlicot (Department of Pathology, Kremlin Bicêtre Hospital), Dr. L.H. Noel (Department of Pathology, Necker Hospital), Dr. I. Brocheriou (Department of Pathology, La Pitié Salpétrière Hospital), Dr. J. Vedrine (Department of Pathology, Saint Louis Hospital), and Dr. J.P. Cosyns (Department of Pathology, UCL Bruxelles) for providing patients’ biopsies and M.C. Verpont for skillful technical assistance.